Little Italy is a perfume by Bond No. 9 for women and men and was released in 2004. The scent is citrusy-fresh. It is still in production. 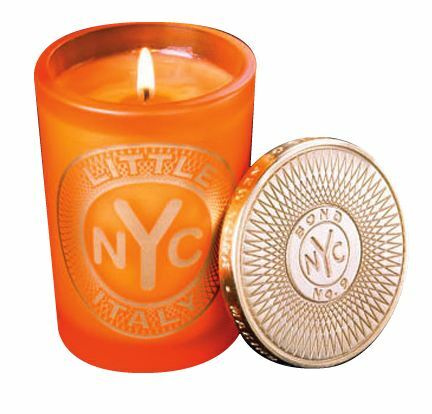 Once the fragrance starts to dry down, the musk enters the ball game & mingles with the citruses which never fade away. It is a simple yet weird concoction that I have difficulties with. I admire strange & unique fragrances, but Little Italy leaves much to be desired. It is not terrible, but it is not great either. As much as I love Bond No 9, I am afraid I will have to pass on this one as there are better fragrances in this category that are done way better than this. Average projection & longevity. I love this! It's actually something I find myself craving to wear! It smells like juicy oranges to me and even if the smell is synthetic, I find myself not caring because it makes me feel happy, energized and cheery when I wear it. It's "zing" just makes me feel uplifted. In my book, this one's a winner! There is something truly addictive about Bond no 9 LITTLE ITALY. I don't know why. It's so simple, yet at the same time so enticing. I love, love, love to spray this stuff on. I have other orange-centric fragrances—including both of the Hermès Orange Verte versions—but the clean musk base of this one keeps drawing me back, again and again. The composition holds up extremely well in hot weather, without morphing into anything unpleasant, as can happen with some citrus scents. The base has an almost resinous quality, which makes this perfume, to my nose, much more than just another citrus cologne. I am familiar with civet, which figures in both JOY and FIRST, of which I have bottles. As far as I can tell, there is absolutely no civet in this composition, and my cat, a board-certified civet detector, does not stir when I run a LITTLE ITALY-spritzed wrist under his nose. This is, believe it or not, a foolproof test, working best as he dozes peacefully, stirring slightly only to lick his lips—when and only when there is civet present in the perfume under inspection! Although with such a fail-safe system in place, I don't really need any further assurance, it is probably worth observing—for the benefit of any skeptics harboring doubts about the accuracy of my civet detector—that the house which created this perfume, Bond no 9, does not list civet as a note. Given the weight and cogency of all of this evidence, it seems not unreasonable to conclude that anyone who thinks that he or she smells civet in LITTLE ITALY would do well to invest in a Neti pot. I like to think of Little Italy as very expensive orange juice, something which has proven to be an extreme disappointment for me seeing as though I am such a fan of the House of Bond No.9. Little Italy however, should just be pushed to the side and be forgotten about. I don't say it to sound harsh, I say it purely out of frustration because this scent seems to fail on manyy levels. Its staying power is extremely poor, the scent itself smells very cheap and for me shows little to no representation of the "scents" of Italy. It seems as though Bond No.9 has taken some inspiration from the seaside villages where citrus fruit and oranges are abundant, and if that is the case with this fragrance, its execution is still poor and very uninspired. Perhaps its just me, perhaps i'm not "getting their intention" or perhaps i have failed to fully comprehend what this fragrance is really all about it. But as far as i am concerned, as someone who owns the perfume and whom has forked out the $230 just to purchase it, its definetly not worth the money and is definetly a reason for why I now sniff everything before i buy it. Write the first Review for Little Italy!